Artist, Adam Strange is a man that believes in Pop Culture. His mind revolves around comic books, toys, television and music, all of which lends itself as perfect subject matter for much of his artwork. Born in the District of Columbia and currently living in Asheville, North Carolina, Adam has also spent time in most of the fifty states as well as overseas. As a teenager he ran away from home to live on Grateful Dead tour, which kept him on the road for many years before setting his sights abroad. Strange spent much of the 1990’s bumming around Europe selling his artwork on the street. During this period, Adam decided to ‘steal’ college by sneaking in to different art schools and learning what he could before being ejected by campus security. Upon returning to the U.S. he began to focus primarily on his painting and incorporating his love for Pop Culture into his work. 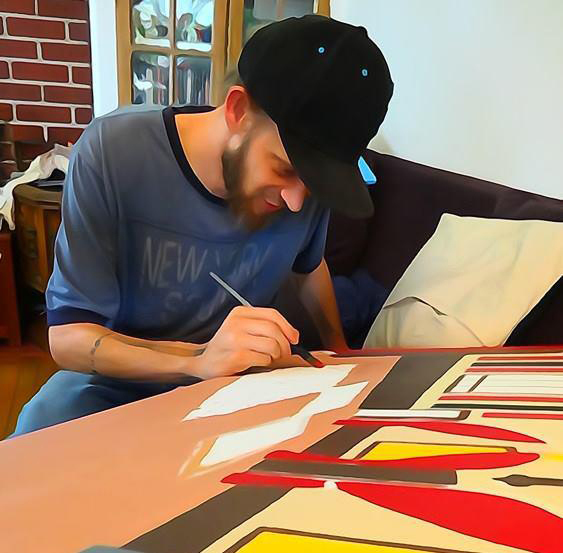 Adam has built a large underground following using social media and word of mouth to help sell the more than 175 original pieces per year he paints. Several notable actors, musicians, artists, and even professional wrestlers have Adam Strange paintings hanging in their homes. Asheville’s weekly paper, the “Mountain Xpress”, recently named him 3rd best painter in Western North Carolina and often describes him as “an Appalachian Warhol”. When not painting, Adam is either the DJ for Grammy Award winning children’s hip hop group “Secret Agent 23 Skidoo” or is sitting around complaining about tourists in Asheville.